We know that there is a tonne of businesses and shady people out there. These people try and claim that they can get you Instagram followers for free. These people jump into Facebook groups. They slide into your Instagram dm’s and will do anything they can to track you down. 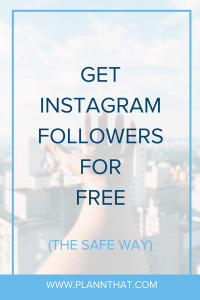 They try and convince you that with their magic system or ‘completely safe methods’ they can get you hundreds and thousands of Instagram followers for free (or for a little bit of cash). Out of all the businesses and people we’ve met who promote this amazing offer, about 99.9% of them are full of donkey turds. Using their services to get Instagram followers for free is dangerous, and can even lead to your Instagram account being temporarily disabled or worse – shut down forever. The good news is that you don’t have to use any under-the-table services to get plenty of new Instagram followers for free. There are actually quite a few ways that you can gain Instagram followers for free. All of which can be on your own, without the help of any shady folks. Let us share with you 5 unique ways that you can capture the attention of new Instagram followers for free. If you haven’t changed your Instagram hashtags in a while, you may be noticing that you are gaining less Instagram followers than you usually would each time you go to post. This is because you are sharing your Instagram content with the same audience over and over again. If you want to get new Instagram followers for free, the quickest way to do this is by changing up your Instagram hashtag lists. Also, try experimenting with new community hashtags. PSSST -> If you want to learn how to find + use the best Instagram hashtags, click here to read our other blog! Perhaps you’ve noticed that each time you post something new to your Instagram grid you gain a few more followers. An easy way to get Instagram followers for free is to post to your Instagram grid more frequently. With a combination of new hashtags and posting more than once per day to your grid, you may find that you gain a whole lot of new Instagram followers. And the best bit? It doesn’t cost you anything! Yaaas! You’ve probably never thought that you can get Instagram followers for free through Facebook? But we are happy to say that you totally can! There are a whole bunch of Instagram-focused Facebook groups (and even groups with specific themes like Travel Instagram accounts) that you can join. Use these groups to meet others on Instagram with a similar niche to you. You can make new friends, gain a bunch of new Instagram followers for free. You can even gain the support of other Instagrammers anytime you have an Instagram marketing question. Go to the search bar on Facebook or search through Groups. Use the term “Instagram” or “Instagram Pod” and you’re sure to find a great group to join. Have you heard of Instagram feature accounts? These Instagrammers usually have a whole lot of followers who are all interested in a certain niche like travel or art. They repost content from other Instagram creators, and those creators usually gain a whole lot of new (targeted) Instagram followers in the process. If you want to learn how you can get featured by Instagram feature accounts, have a read of our handy-dandy guide here. We all know that it is important to engage with others on Instagram who are using the same hashtags as you. But one thing that no-one really talks about is this. It’s really difficult to get people to follow you using this strategy if the people you are engaging with have a whole lot more followers than you. It is far more likely that you’ll gain Instagram followers for free using an engagement strategy. For example, leaving likes and comments on other people’s content if those users happen to have a lower follower count than you. Ideally, you should try and leave genuine and kind comments on the posts of Instagram users who have similar interests to what content you are sharing. You can find these people through hashtags or you can be super sneaky and see who is following your competitors on Instagram. PSSST -> Want to be super sneaky and find out what Instagram hashtags work well for your competitors? Download the Plann app and discover their winning hashtags now! And there you have it! You now know a few techniques that you can use to get Instagram followers for free. Excited? We hope you are. So, here’s a reminder for you before you run off to gain more Instagram followers. Your follower count isn’t an accurate picture of how ‘good’ your products are. Nor is it a description of how amazing you are as a person. Whether you have 1 follower or 1 million, you are an amazing person. We know that you can do great things! If you’d like to stay more consistent with your Instagram posts and organise your hashtags like a pro, take a look at the Plann app for iOS and Android. Click here for more info on Plann.